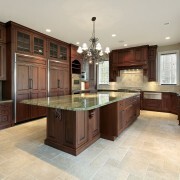 When purchasing cabinets, quality, cost and style are important. 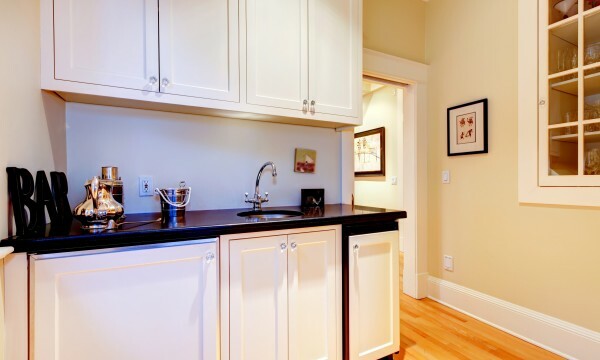 Make your decision easier by learning about the pros and cons of melamine kitchen cabinets. Melamine starts with a compressed wood particle core. It is then covered with a resin and paper finish that can be manufactured to embody various styles and colours. 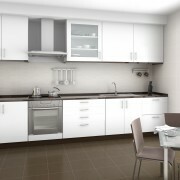 Melamine is often used for cabinetry in kitchens, bathrooms and other areas throughout the home. Melamine cabinets are resistant to many of the common issues presented in a kitchen, whether it be excessive moisture, heat or stains. The reason why melamine can resist these external elements is because of its tough outer coating. This coating is also easy to clean. Because melamine is a synthetic material, it can be produced with an almost endless number of finishes. 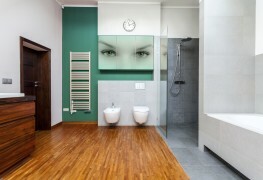 You can select from faux wood grains in various shades or solid colours. With this level of choice, you can find the perfect match for your kitchen’s style. Unlike solid wood that can vary in grain patterns and colour, even within the same order, melamine offers a consistent finish since it is manufactured in a controlled setting. Compared to solid wood cabinets, melamine cabinets are offered at a much lower price point. 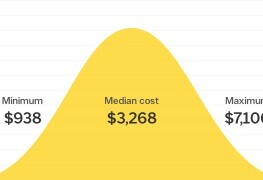 With these savings, the cost of your new installations or renovations will be a little easier to swallow. Although the weight of the cabinets may not be your first concern, this may mean having to purchase heavy-duty brackets to install your new cabinets. Without proper hanging brackets, the cabinets could fall off your wall, possibly causing expensive damages. 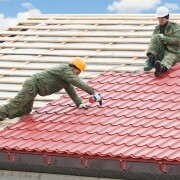 Although the outside resin coating is durable, it can be prone to chipping. Chips will leave the internal wood particle core exposed, and this can be very unattractive. Also, if your cabinets do chip, it can be expensive to have them refinished. Because of the nature of their construction, melamine cabinets might not pair well with nails and screws. If used improperly, nails and screws can cause the melamine to splinter. For this reason, having a professional installation team can be beneficial. If the wood particle core of the cabinets gets saturated with water, it can compromise their structural integrity. Water can be absorbed into this material more easily than solid wood, so you should be aware of this when installing cabinets next to your sink. If you are on your way to the hardware or furniture store to shop for new cabinets, consider the pros and cons of melamine kitchen cabinets. As with any other material, there will be positives and negatives, but remember to keep your budget, product quality and preferences in mind. What kind of cabinets will benefit your kitchen most? How much does it cost to refinish cabinets? 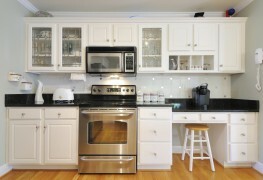 Thermoplastic kitchen cabinets: good choice or best to avoid? Why choose stainless steel kitchen cabinets?